At CityCentre restaurant Straits, the focus is on southeast Asian fusion. 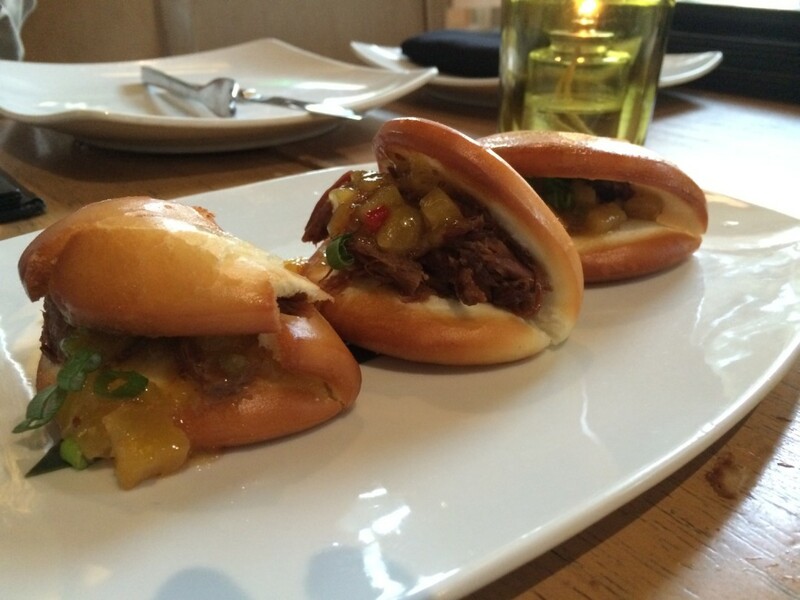 Kick the mu shu pork, and come in for some Polynesian pork sliders instead. Homemade Roti Prata will change your life and your snacking for the better. When you hear "Asian food," what is the first dish that comes to mind? Chinese mu shu pork? Japanese sushi? Korean barbecue? Vietnamese pho? 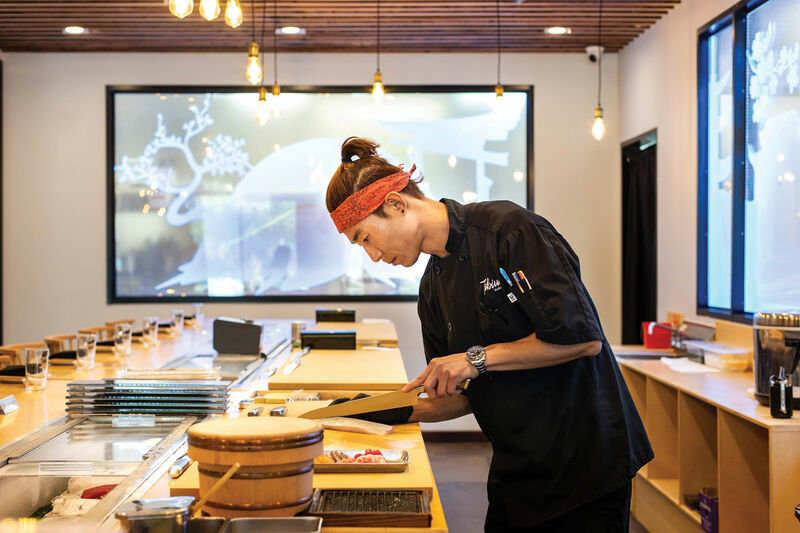 Straits in CityCentre redefines what many assume of Asian food by combining some of the less expected southeast Asian cusines in some of the best continental fusion I’ve tasted. Indian curries, Singapore rice noodles, Thai peanut sauces and more all come together in this bar-restaurant combo. As I write this, I'm once again dreaming of its creamy, dreamy curries and the butter chicken dish I've been craving since I first tried Straits last October. Recently, I was able to get back to Straits to quiet those cravings. It had been a while since my family and I last popped by, but when we did this past weekend, we found that the menu had changed a bit—and I found it a change for the better. Though more consolidated and much shorter, the menu still posssesed that wide swath of great flavors and southeast Asian flare. 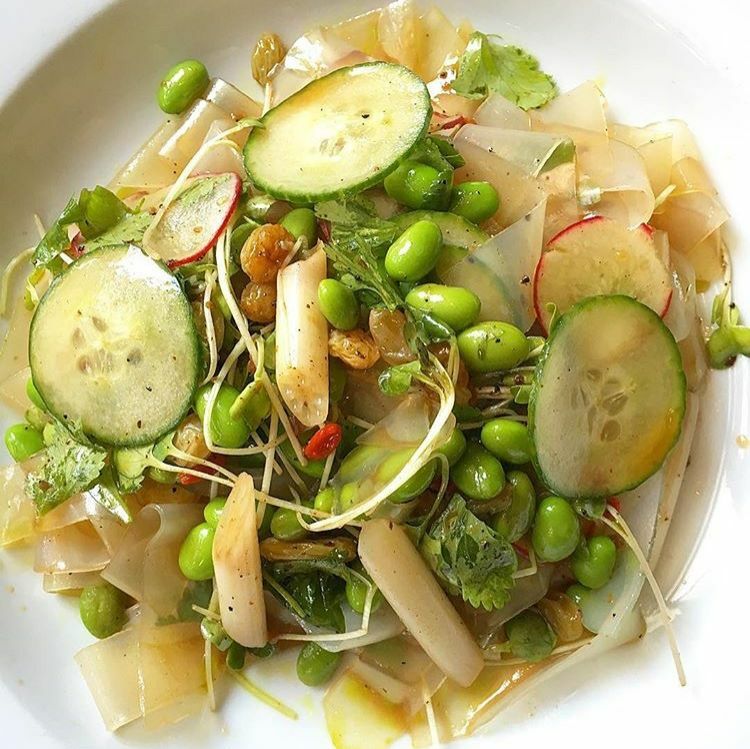 As we sat down in the largely empty restaurant on the pleasantly warm and bustling evening near CityCentre's main green, we browsed our new choices. The sliders are a special, so get them while they're still on the menu! 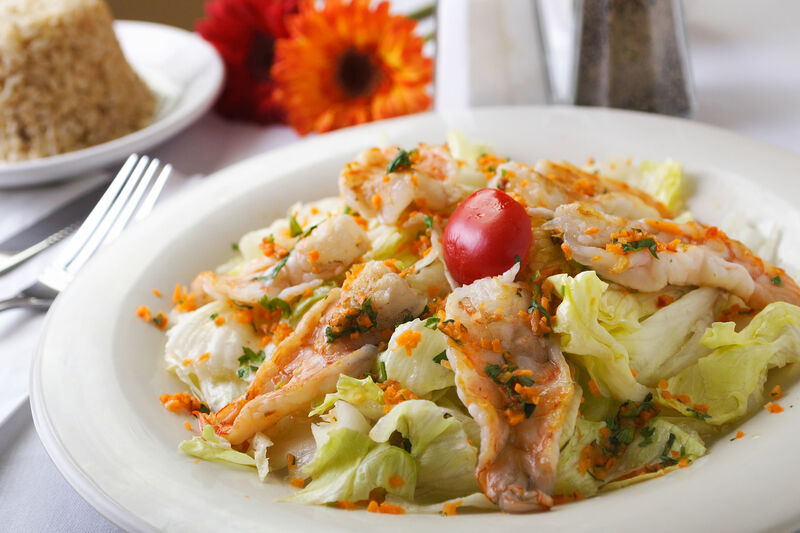 We began with some awesome apps, since there's nothing better than starting a meal on a high note. 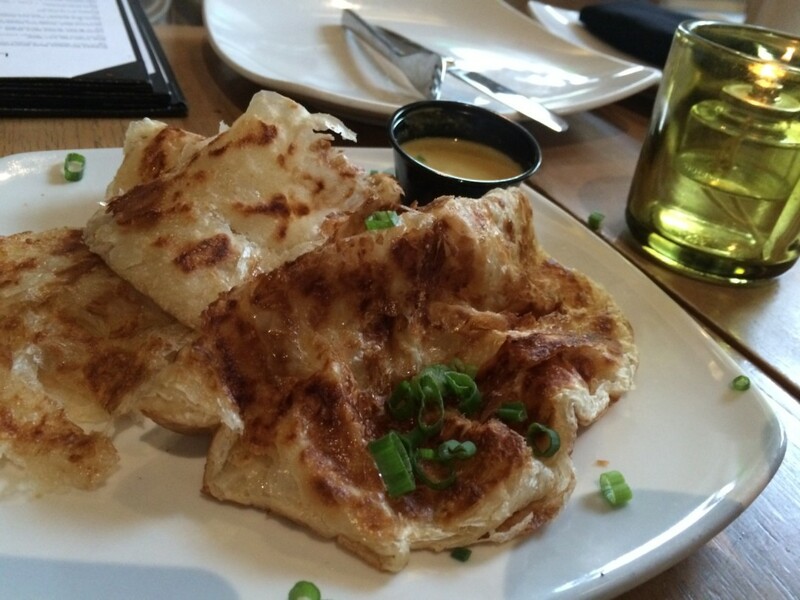 Housemade roti prata with a gentle yellow curry dip was absolutely amazing. We ordered this one thinking that it would be something basic, as the menu description of “Indian Flat Bread” made us assume it could be a good thing to keep on the table as a palate cleanser, or perhaps something to help temper the spicier dishes on the menu. But we were surprised to find that roti is miles away from our expectations of, say, a version of naan. Roti is a warm, crispy, thin, pull-apart bread that was simply amazing, and has made the short list of things I need to learn how to make at home, because I’ll be needing some more roti prata in my life on the regular, let me tell you. Next came the Kalua pork sliders, a seasonal special. This dish took a stretch out to the Pacific, combining a Chinese bao bun with Oceana/Hawaiian-style pulled pork. Cooked pineapple glaze covered everything, giving a great tropical feel to the springy sliders. 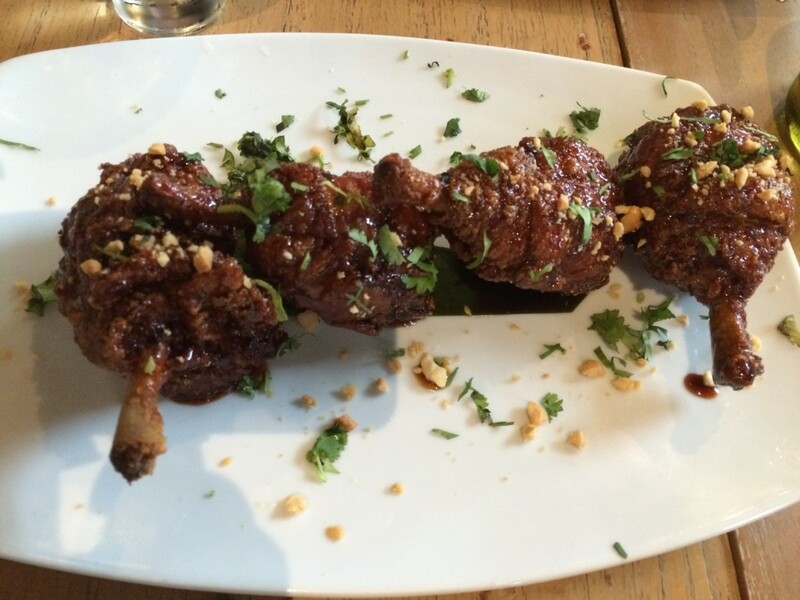 Last in our array of apps were the kung pow chicken lollipops—not a new item, but a frequent favorite. To put it simply, if you like crispy fried chicken and moist dark leg meat all covered in a savory-sweet sauce with a hint of heat, you'll love Strait's chicken lollipops. 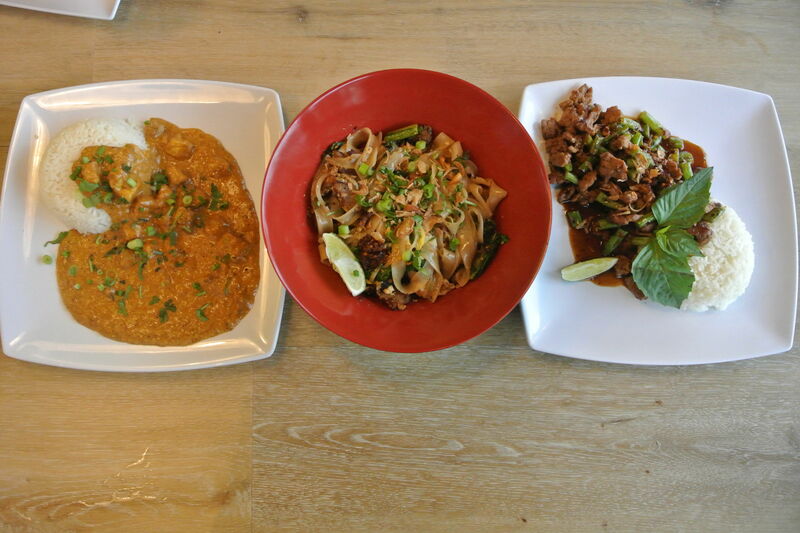 Craving peanut sauce and fresh cilantro? My actual dinner, the main entrée to my smattering of taste combinations, was a heaping dish of chicken pad thai—a dish I am always hungry for. It bears mentioning that the entrees at Straits are large. Plentiful and generous, they could easily be shared by two and no one would walk away hungry, but for those of us who love having tasty leftovers for a Saturday morning breakfast, then order your own dish and pocket the surplus for yourself. 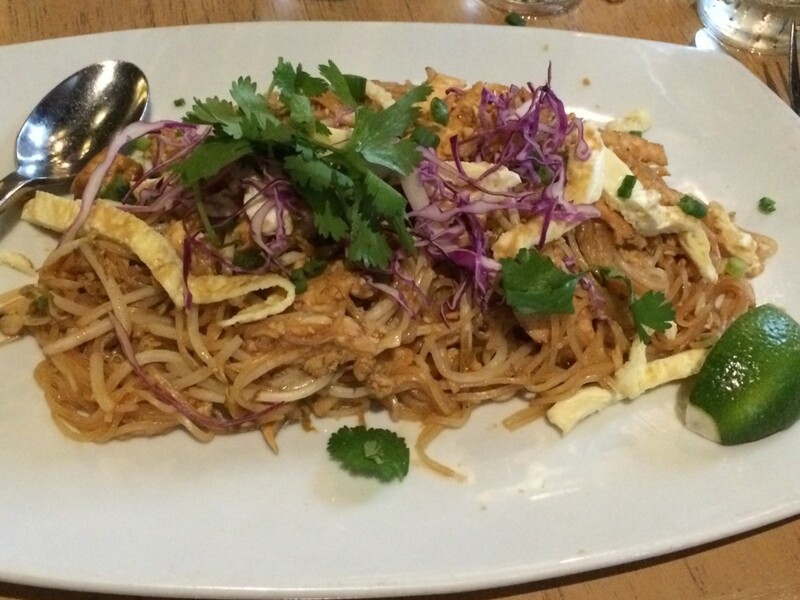 My pad thai was everything I wanted and more: thin, long noodles with onions and large pieces of freshly grilled chicken, all coated in an earthy peanut sauce—one that packed a small, spicy kick—topped with a lime wedge for squeezing and a scattering of cilantro. I couldn't have been happier with my food, though I can't say the same for the rest of the Straits experience. As I mentioned, the restaurant was largely empty last weekend. Why would an establishment with food this consistently good be so sparse on an evening that had families flooding CityCentre for different events and weekend leisure activities? The noise, if you ask me. My kind of lollipop is a chicken lollipop. Between an open kitchen window along the wall of the main dining room, and a bar which plays grating club music, the cacophony at Straits makes a dining experience feel cluttered and loud. The bar has the added hindrance of being decidedly un-family-friendly, meaning that the hundreds of parents who bring their kids out to the CityCentre green for the evening probably aren’t going to pop in for a nice dinner out. On the other hand, the folks interested in the more bass-centric appeal of their bar section aren’t too interested in Straits' incredible food—they’re far more interested in the clubby vibe and the seasonal mojito flavors (though I can’t fault them for that; the dragon fruit option is delicious). In my opinion, Straits at CityCentre is trying to straddle two different concepts, when it should have gone with only one. 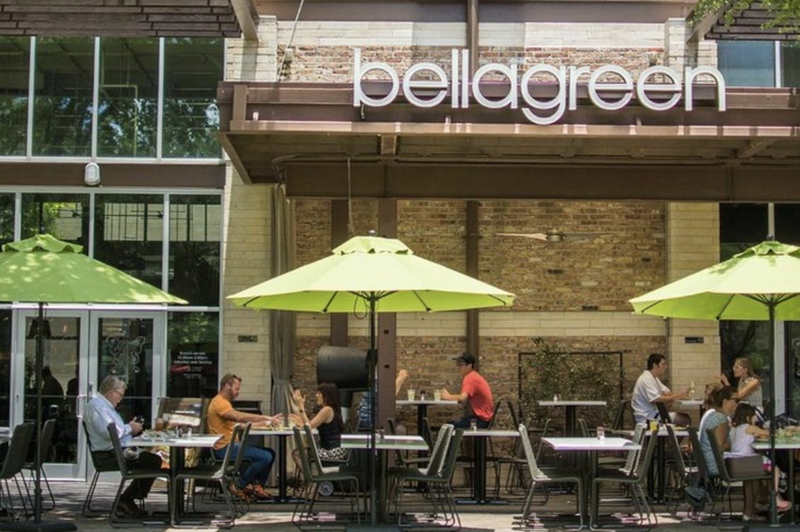 Either be a hip southeast Asian gastropub and expand the bar, or be a restaurant and try to eliminate the noise pollution. I’ll still be going back in the future, as I still dream of tat butter chicken, but I’ll probably try to sneak in during lunch hours—at least then, the bar isn’t open and the music isn’t so loud.